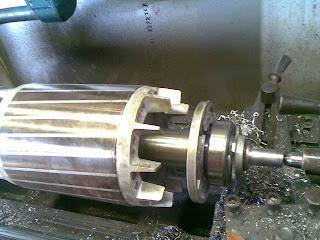 Here is a photo of the rotor in the lathe. The shaft end was turned down to just under 12mm. I had to keep the dead centre well oiled during the process. Also had to stop a couple of times to stop it getting too hot and affecting the bearing on the shaft. As there was significant weight on the centre, it would be best to support the bearing.